It couldn’t happen any other time than the middle of the night. That ringing is not a dream. There, on the other side of the line, is the voice you have tried so hard to forget while secretly longing to hear again. You’re half asleep so you can’t be sure the conversation is actually happening. She’s in town. She’s leaving tomorrow. She wants to see you. Nothing good can come of this but you can’t say no., not to her. So you drag yourself out of bed, throw on some jeans and prepare yourself to revisit every memory, good and bad, that the two of you created. 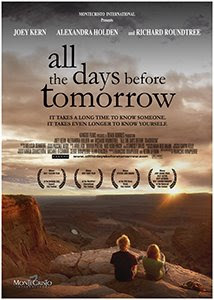 It’s a scenario most can relate to and that common experience is what makes Francois Dompierre’s ALL THE DAYS BEFORE TOMORROW, a dissected history of Wes (Joey Kern), Alison (Alexandra Holden) and the space they created together, easy to connect with and even easier to fall in love with. Dompierre called Montreal his home for many a year before he moved to Los Angeles to complete his graduate studies in film. For the first little while, he struggled to find confidence in himself and his ability to make a meaningful contribution to the overcrowded world of film. His belief in himself eventually grew out of the friendships he made with his fellow film students and consistently working on films. Once the craft began to work its way into his nature, he penned his first feature, which is loosely based on a woman he once knew. 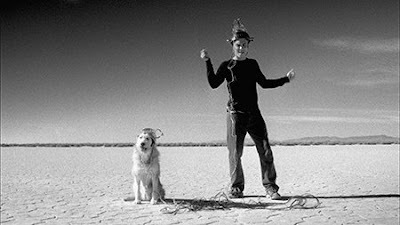 Having a wide group of talented individuals to choose his crew from (including cinematographer, Gavin Kelly, who shot the Academy Award winning short, WEST BANK STORY), Dompierre set out across Utah, California and Montreal to put all those years of training to test. Thus far, his labor has been rewarding as the film has been screened at numerous festivals throughout the United States and most recently, it has come home to Montreal at the World Film Festival, where it is competing in the First Feature category. While it may have first stemmed from the need to heal himself, the script for ALL THE DAYS BEFORE TOMORROW grew into an insightful examination of the differences between the sexes and more specifically between these two people. At times they infuriate each other while at others, they show each other a potential they didn’t know was possible. At all times though, they fascinate the viewer’s mind while their brilliant surroundings engage the senses. After seeing the film, I suddenly felt nervous to meet Dompierre. How could I interview him without gushing the entire time about the subtleties and simple insights that worked themselves into my soul within the film’s first minutes? We ended up having a very real conversation that ended, much to my surprise, with an embrace instead of a handshake. I guess I must have still gushed a little. Joseph Belanger: If I can be honest, I was concerned the film might not come together the way I felt it could after seeing the trailer but really, your film truly surprised me from beginning to end. Congratulations. JB: It was my pleasure really. There’s a point early on in the film where the characters come home to Montreal. I didn’t see that coming and it warmed my sensitive Montrealer heart to have seen that. So after so many festival screenings in the United States, how does it feel to bring this movie home? FD: It’s a huge deal. I haven’t been nervous like this is such a long time. We’ve been showing the film for six months and you can give me a crowd of a thousand and I don’t care because I don’t know anyone there. Here in Montreal though, I was stressed. I had all my friends and my family coming to see it. Strangely enough, their opinions really matter to me. I was actually curious to see if it would be received well in the Montreal culture. I was worried they would think it was too American or commercial, which I don’t think it is. Are they going to think it’s cheesy because of the romantic elements? But it ended up working so well; everybody loved it. JB: With the film being so well loved, how is that you don’t have wider distribution for it? FD: We’re a little under the radar. Making a film is one thing but finding out about the politics of distribution … Wow, that I was not prepared for. I was prepared to make a film, technically and artistically, and I put all my heart and hard work into it. I naively felt that if the film were good then somehow, it would surface. That could still happen in the long term. JB: How long do you think you’re going to have to wait though? When watching the film, I feel a sense of pride as a Montrealer to see what good can come out of this city. The script is great; it looks great; the acting is great but there’s something about it that gives me pause as to whether it has the potential to play well in wide distribution. Then again, why wouldn’t it? FD: It’s a hard thing to figure out. It’s not even that distributors don’t like it; they’re just not seeing it. Some of the bigger festivals have turned us down but those selection committees never even watched it. The interns get over 100 DVD’s a week that they have to go through and pick five from those. Toronto turned us down which is a shame because they should be proud but our last big hope is Berlin and Telefilm is helping us there. I know that if I can get a selection committee into a theatre to see a print, I think I could get in. I feel like the first fifteen minutes of my film still have some issues so if you’re watching that many DVD’s in a week, you might turn it off right away because you think it might be good but there is surely better. But if I can just get people in a room where they can’t leave, y’know. And this is what might happen in Berlin. If we get into Berlin, we might as well have played in Toronto because our chances of getting picked up are just as good there. It’s just frustrating because now that it’s been made, I just really want people to see it. Then again, a lot of directors have troubles with their first films and still go on to promising careers. JB: Speaking of other directors, and I hate to be so plain, but as I drew many comparisons to other directors while watching the movie, I wanted to know who your influences were. FD: One film I really like is LOST IN TRANSLATION. I actually wrote this film before seeing it and then you see this girl in Tokyo and the similarities really freaked me out. Oh great, I’m ruined. I almost changed it to Hong Kong but I decided not to. I really liked CRASH, which came out around the same time we were making this film. And even then I thought that people would think that I was stealing the snow scene from CRASH. I ended up meeting Paul Haggis and I told him people would think I was stealing the snow scene from his movie. He told me not to worry because a lot of people told him that they thought he was ripping off the frog scene in Magnolia. And that film actually had a huge influence on me too. I like Wong Kar-Wai, Woody Allen, Alejandro Inarritu. JB: I actually saw some Woody Allen in your film. You framed Montreal much in the same way Allen does New York in Manhattan, like postcards. FD: And Manhattan is my favorite film of his. That is such an amazing compliment. BABEL, TRAFFIC, Michel GondryTHE SCIENCE OF SLEEP or ETERNAL SUNSHINE OF THE SPOTLESS MIND, all these films have such a human component to them, always so much emotion, all gorgeous visually. They’re all like hyper-real, that much prettier, that much more dramatic. JB: So these are the people that have inspired your style and filmic approach, now what was the inspiration for All the Days Before Tomorrow? FD: It’s loosely based on someone I met. I’ll be very honest, I wrote it at first just to get it out of my system, deal with that person literally. I was in love; it wasn’t working out. I was really bummed for a whole year. So I decided to be a full cliché and just write about it to get it out of my system. It could have been really bad but it was very therapeutic. Then, very quickly as I was writing it, it became something else. It’s very different from what happened between us but that was the fuel. FD: See, this is a surprise. I always thought I was writing this really specific film and obviously it is really specific to me and what was going on in my head. I never really thought that people were going to be able to relate to it. I wrote it thinking that if people like it, great, and if they don’t, well too bad. As it turns out though, so many people relate to so many different aspects of it. After the screenings, people come to talk to me or send me e-mails afterward. It’s loaded. JB: And subtle. 30 seconds after Alison enters Wes’s apartment, she is picking things off of his sweater. How much of these kinds of details come from your direction or your script and how much of this comes from the actors’ performances? FD: A lot of the details were very specific to the script but obviously they’re really good actors. I do a lot of takes. I knew I had no film if the acting was not superb just like I knew that I had no film if the dialog was flat. We designed everything regarding shooting this film around getting good performances. Every day, I’d show up and take half an hour with the actors. We would take all the direction out of the script and just leave the set-up and the dialogue and have them run it to see where it would go without thinking too much. They brought a lot and we fought on a lot of things. I’m an unproven director and even if I was proven, I’d still have to get really involved. By far, the hardest thing to get in this film were the performances but they really did a great job. JB: Indeed they did. In fact they did so great a job that you really get to know these characters when watching. They’re quirky, endearing and very real. After spending so much time with them during the production process, do you miss them now? FD (laughing): I’m really happy you asked that. Yes, I do miss them. Even though I’ve seen the film like 300 times, I still get wrapped up in these people. It’s a strange process, to take what’s in your head and then somehow put it out there and still want more. I do wish I could be with these people again. JB: Me too and I’ve only seen it once so far. This interview has inspired me to write my first screenplay. I have written so many plays, in many languages and yet knowing that he was so unsure of himself and it took him that one “try” to just get out there and see his real gift…well, I simply cannot wait anymore. Thank you so much for doing this interview! One of my favorite past times is watching movies. I can movie search at a video store for hours like people who go shopping for the right jeans. I had ramdomly looked at the DVD cover because of it’s name. At the time I was picking a movie to take to my mom’s and I knew I couldn’t take this without watching it first to check for inappropiateness. So I put it in my memory bank for later. Then I went to rent this movie right after getting the harsh hit of realization that my bestfriend (whose a guy) is officially going out with a girl I don’t want him to be with. And that OUR TIME together is now going to be hers as well and I have no control of it. So I went for this movie thinking maybe some truth or comfort will come out of it or me from watching it. And I fell in love. The movie was soooooo awesome. I feel connected to it. And the acting, well it’s just soo real and sweet. I’ve watched this movie 5 or 6 times and I’ve only had the movie for 3 days. No matter how many times I’ve seen it, I did get tired of it or certain parts, I just admire more and more the two friends. And now I’m web surfing to find out about the director’s thoughts which lead me here. Thank you! I truly loved this movie. Thank you so much for your interview and your wonderful review. In watching it (sadly only now as I don’t get to watch movies that much), I felt that exact same longing channeled through when I saw Lost In Translation. It truly struck a chord. The scene at Christmas in Montreal: It still doesn’t fit into the timeline of the movie for me… unless (as I hope) it is TOMORROW. The only way it seemed to work out was if the snow scene that kept her with Wes one more day was TODAY and that the flight back to Tokyo to tell Kai that it wasn’t working out would be the beginning of TOMORROW.